The Taylor family has been through an incredible ordeal over these past few weeks, but they’re finally seeing the healing hand of God at work. 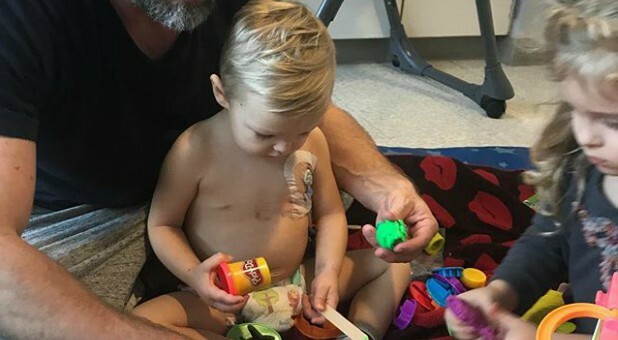 Joel and Janie Taylor report their 2-year-old son, Jaxon, is finally on the mend after weeks of fighting a devastating E. Coli infection that had shut down his kidneys and caused multiple life-threatening complications. Joel is the CEO of the Bethel Music worship ministry, and the Bethel community has rallied in prayer around the family. Little Jaxon and Addie have been fighting the same dangerous E. Coli infection in the hospital, but Jaxon came down with it first and his situation had become critical. The family had asked people to pray that Jaxon would be able to urinate once again since his kidneys had been shut down for so long, and he’s finally been able to that too. She also reports a miraculous turnaround for their daughter Addie, crediting the power of prayer as thousands of Christians around the world have been praying around the clock for Jaxon and Addie. “Thanks to your prayers, Addie’s diarrhea has slowed down significantly, which is the opposite of what the drs said would happen. Your prayers are working! Please keep praying for complete healing and no complications,” Janie said. And in her most recent post, Janie recounts more of the scary trial they’ve been through and the miracle they’ve witnessed on the other side. “Jaxon’s name means the Lord has been gracious and has shown favor. Every time this boy says a word it is a miracle of the goodness of God. The night his cognitive function left him was the scariest night of my life. He was unable to speak, respond to stimulus or recognize me. I would say it was the darkest night of the soul but in actuality, I felt God’s light and goodness even there in the midst of it. I felt carried by your prayers in a way I will never be able to express,” she says.